Adopting techniques used in computer games could improve student engagement in education, according to research conducted by Therese Charles who receives her PhD in Computing this week . Therese’s doctorate research entitled E.L.E.G.A.N.T (Enhanced Learning Engagement using Game AbsorptioN Techniques) was motivated by a belief that, with careful design, students in higher education could achieve the same level of engagement as those who play computer games. “Student engagement is crucial to the success of learning but this is often difficult to achieve in practice. One significant factor is the quality of the learning content; also important, however, is the suitability of the process through which that material is studied,” says Therese. Therese’s PhD focused on that process, considering in particular how student engagement could be improved using techniques common in digital games. Her supervisors, Professor David Bustard and Dr Michaela Black noted that “In the experimental studies carried out by Therese, with first year undergraduates at Coleraine, there were clear signs of students devoting more time to the modules involved, leading to consistently better performance. The results were much better than we had anticipated”. Therese (Nee McGinnis), who is originally from Greysteel now lives in Portstewart. She spent a few years as a rally driver before a serious accident in 1991 forced her early retirement. 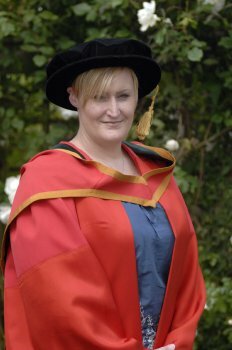 The accident and subsequent injuries prompted her decision to go back to education and in 2006 she graduated with 1st class honours in Computing from Coleraine. She is married to Dr Darryl Charles, a lecturer in Computing at Coleraine. Therese is currently manager of Atkins Angling, a successful online angling business based in Kilrea.